Brimful Curiosities: 1st Birthday - Choices, Choices ... Help! Holy cow! How can a year fly by so fast? The little guy is turning one shortly, and I'm unprepared. Do all second children get neglected like this? For our daughter's first birthday I made special invitations, she had three different cakes and two parties. A little overboard? Maybe, but it's a special day. Now, the second time around, I'm dragging my feet. Time to start planning. At least I can check a few items off the list. We picked a date and time for the party and notified the relatives. Grandma volunteered to make the little guy's cake so the a messy cake face picture is all but guaranteed. I've written out most of the lunch menu. I've also chosen a theme: firetrucks. 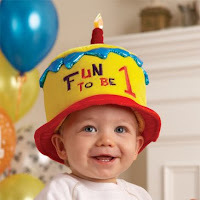 I found an online retailer that specializes in 1st birthday supplies called 1st Wishes. 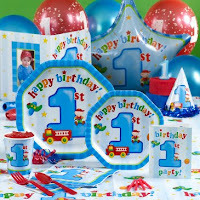 They offer over 30 first birthday party themes, firetrucks included. See that great "Fun To Be 1" hat in the picture above? One of the many cute 1st Wishes birthday supplies! I'm thinking we definitely need the hat. But, I'm lacking one huge component. The gift. We haven't bought him one yet. I need ideas. A little help, please. What is a must have gift for a one-year-old boy? I'd greatly appreciate any comments or advice. Cute. I did a firetruck theme for my son's 2nd birthday. What about something from the FP Little People line? I thought they had a firehouse. What about a cozy couple (outdoor car)? Have fun! Have a fun party- the theme is adorable! There is actually a firetruck cozy coupe - my son got one for his 2nd birthday and LOVED it. Have a good party! I'm going to tell you everything my little man got for his bday...or at least what I can remember! His two favorite things that he got are the zebra boune thing. I THINK its call sit and spin zebra or something. AND the least expensive thing was a lawnmower that pops those balls up when you push it. He LOVES that thing..him and the 3 year old that I keep push it everywhere. He also got a wagon that has two seats in it that has come in so helpful at the park, zoo, parades, and walks around the neighborhood. And some other little things like trucks. He actually got a firetruck that will squirt water for his sandbox. we got our baby this cool wooden toy from melissa and doug (they're found online at at toy r us and places.) it's a little tower with four balls and a mallet. she still loves hitting the balls and hearing them clunk clunk clunk. it's so great. For years all of our children got a ride on for their first birthday as each of them was either just walking or on the brink of walking. Finally we had enough ride one or Little Tyke coups that such a gift became redundant. But that is what I would suggest is a rideon/pushtoy that your little one can toddle along behind and then eventually ride. Happy Birthday to your little one as you celebrate his special day! 1st birthdays are for moms and dads LOL. I remember both of my kids 1st birthdays and we of course had the whole family over, tons of adults. I'm having so much fun visiting the blogs from Bloggy Carnival, now that I have time to read and comment.